To gaze upon the visage of Sri Lanka's biggest Buddha, one must first pass through the Tunnel of Hell. 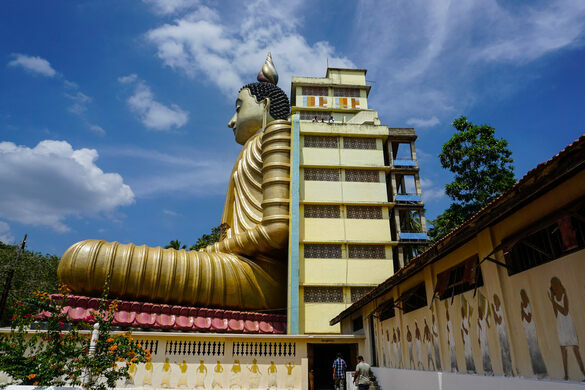 Wewurukannala Vihara is most famous for a gargantuan seated Buddha waiting to greet devout pilgrims, but the temple’s most wonderfully unexpected (and unsettling) feature lies somewhere along the way. This Colombo wetland is an unlikely wildlife haven just outside the capital city. The temple is divided into three parts, the oldest of which dates back to the 18th-century reign of King Rajadhi and has a more modest Buddha worked into the structure’s outward-facing architecture. The second element, the giant Buddha statue, was constructed in the 1960s when a penchant for larger-than-life roadside attractions took the world by storm. At 160 feet tall, it literally and figuratively rises above the quagmires of earthly life. 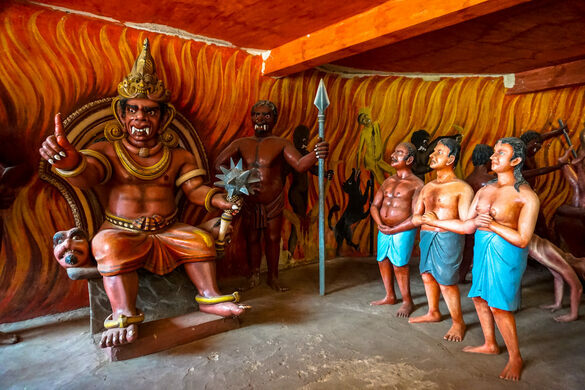 Which leads to the third, most overlooked, aspect of Wewurukannala Vihara: in order to meet the big Buddha up-close, visitors must first navigate the Tunnel of Hell. Down in the tunnel, life-sized models illustrate what will happen should one succumb to all those earthly temptations lining the path to enlightement. 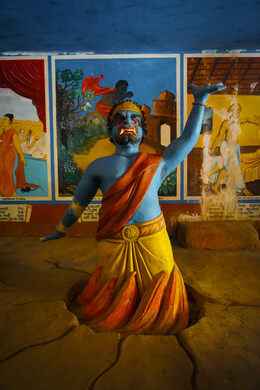 It is Buddhist Hell made tangible, played out in cartoonish horror before visitors’ eyes. Highlights include immersion in boiling cauldrons, disembowelment, and sinners being hacked to pieces by human-like demons with fangs. The end result is a visit to Wewurukannala Vihara and its message reads as strikingly one in the same: Don’t stop in the middle, for a serene paradise awaits just on the other side. At the town of Dikwella, 22km from Matara, a road turns inland towards Beliatta. The temple is approximately 1.5km down the road.